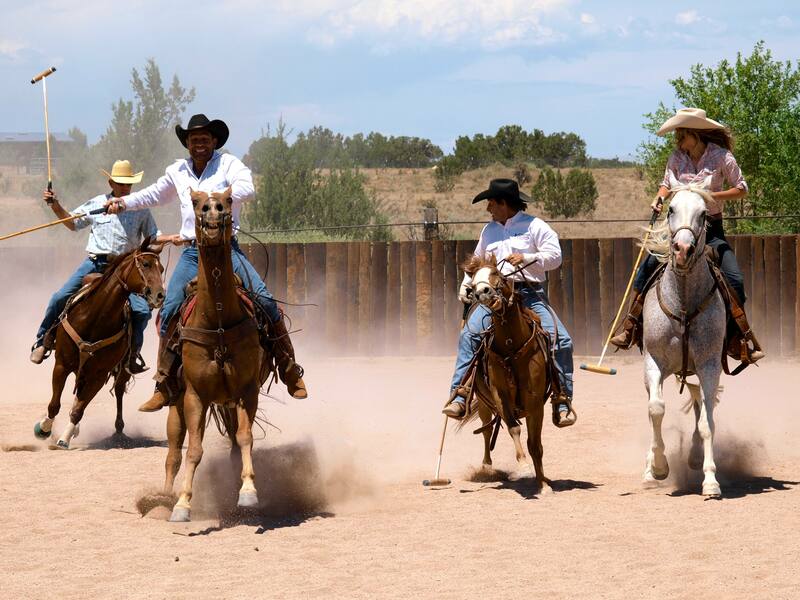 It’s Day of the Cowboy here in New Mexico and what better way to celebrate than a game of cowboy polo! Sponsored in the U.S. Senate in 2005 and 2006 by Wyoming Senator Craig Thomas, the National Day of the Cowboy honors cowboy and cowgirl culture and heritage across the country. Cowboys aren’t a relic of the past here in New Mexico; they’re alive and well and still working on cattle, horse and dude ranches all over the state. 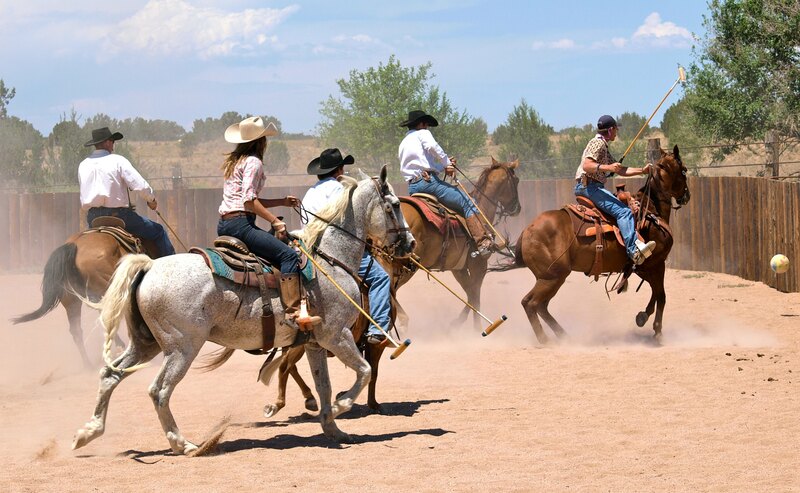 To celebrate, today the Clint Mortenson Ranch, just up the road from me near Santa Fe, hosted a Cowboy Day party highlighted by a Cowboy Polo match. Cowboy Polo is just like regular polo except that it’s played in a dirt rodeo arena with quarter horses and western saddles. 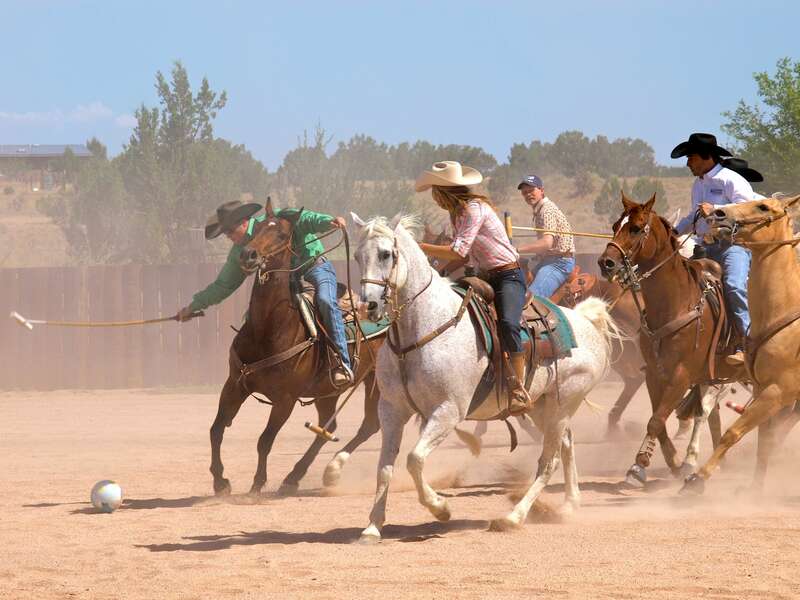 Cowboy polo teams are often smaller than the standard four, depending on the size of the arena (today there were 3 to a team), and the game is played with a soccer ball-sized rubber ball instead of the small hard ball used on turf. 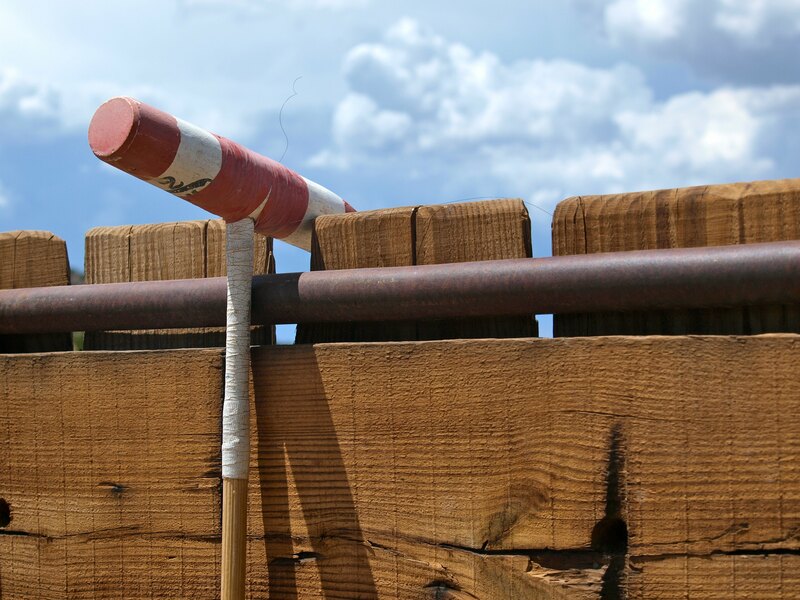 Otherwise, the objectives and the rules are mostly the same as regular polo: use the mallet to hit a ball through goals on either end of the playing field. Quarter horses are usually bigger than thoroughbred polo ponies, but they’re ideal for the game: smart, savvy and handy. Quarter horses can stop and turn on a dime and since they’re already trained to doggedly track a cow around the arena, they usually pick up on following the ball pretty quickly. 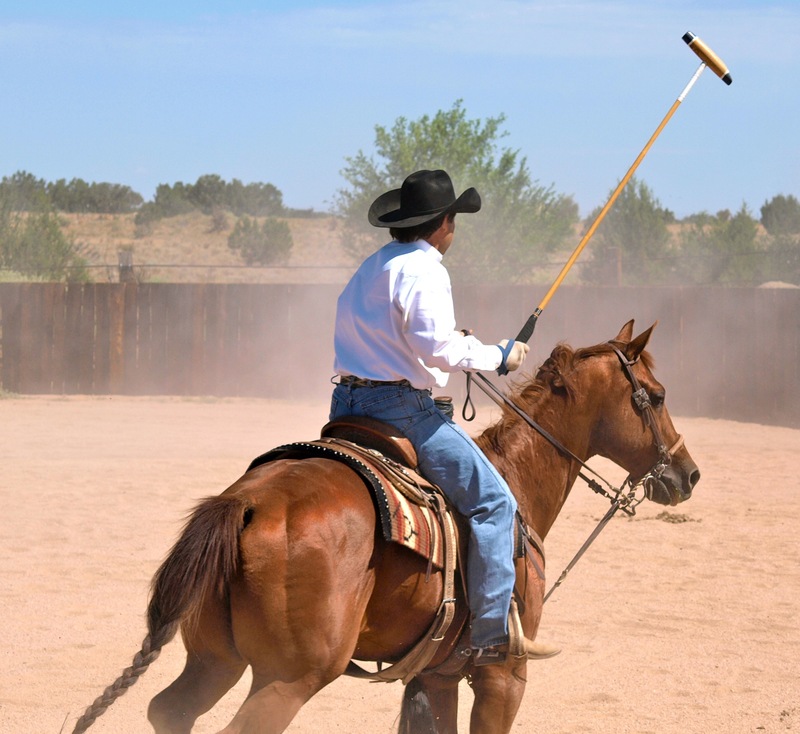 As with regular polo, it’s always a wonder to me that more people and horses don’t get whacked with the mallets, which are made of either bamboo, cane or fiberglass and topped with a hard rubber head, but a cadre of rules and two referees in the ring keep wild sticks to a minimum and no horse or cowboy was injured today. The most strictly enforced rule states that anybody who falls off his or her horse has to buy beer for the whole team. Nobody fell off today, though there were several close calls. Cowboy polo was invented in Florida in 1952 and had its heyday in the 1970’s when the US boasted 75 teams. Interest has tapered off since then; the last national tournament was held in 2002 and the National Cowboy Polo Association disbanded in 2005. A few active teams still persist in Montana and Clint Mortenson does his part to keep cowboy polo alive here in New Mexico. In his tack room, amidst dozens of western saddles, racks of spurs, piles of lariat rope and hundreds of bridles, he also keeps a incongruous rack of polo mallets. Click here to see more photos from today’s cowboy polo match. Cowboy up! 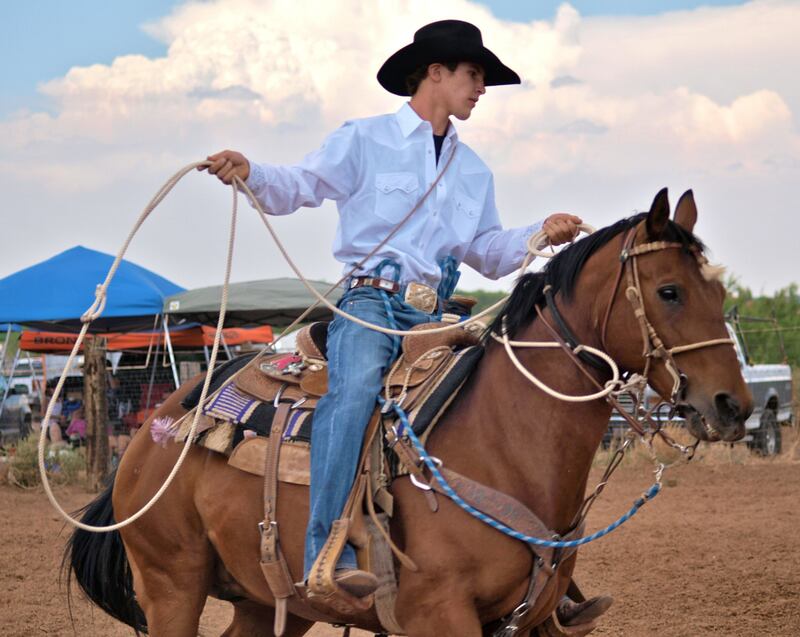 This entry was posted in Cowboys & Horses, New Mexico, Photography and tagged cowboy, cowboy polo, day of the cowboy, New Mexico, polo. Bookmark the permalink. 6 Responses to Cowboy Polo! Here in Montana we call what these folks here are playing arena polo. For us, cowboy polo is played with five players on each team and the arena split into five zones. Come on up and we’ll show you! Okay I’m conincevd. Let’s put it to action. Thanks Jenna! Next time I’m in Montana some arena polo will definitely be on my list! Loved it! Hi, are your photos for sale. I am interested in some of the cowboy polo scenes.